Take out garbage and clean trashcans of residual food scraps. Place all fresh fruit in the refrigerator. Keep dirty dishes from piling up on the counter by washing them in a timely manner. Seal all boxes and bags of food and store all open food like flour or sugar in a plastic bag or container. Drain dishwater from the sink after each use. Use a humidifier to reduce the amount of moisture in the air, especially in basements. Notice whether any light is showing underneath exterior doors and garage doors. If needed, install a threshold, door sweep or rubber weather stripping seal on the base of the door. Make sure the seal comes in contact with the floor. Locate and seal all utility openings where pipes and wires enter the home. Keep all doors shut when not in use or install a self-closing screen door. There are also additional steps you can take outside the home to help keep bugs away. First, work on eliminating clutter by doing a general yard clean up. Remove leaves and grass clippings that might be bunched up against the foundation or laying on window ledges. Trim weeds and rake back mulch or pine straw that might be piled above the foundation. You should also cut back all tree limbs and shrubs. Keep them at a distance of at least 18 inches from the house exterior. Place firewood away from the house so pests can’t climb up and in. Also work on eliminating breeding sites outside the home. You should clean up pet droppings that attract flies and spread bacteria. Eliminate litter or garbage from piling up outside and place all items in a sealable trashcan. Make sure all water drains away from the home and remove standing water, as that can be a breading ground for mosquitoes and other pests. Finally, if you have a garden, flowerbed or fruit trees keep them healthy and thriving. According to the EPA, healthy plants resist pests better than weak plants, thus lowering your pest control needs. All of these steps will reduce the need for pesticides, save you money from calling exterminators and help you keep the bugs where they belong – outside your home. Questions: Are you OK with a few bugs inside the home? What’s the biggest bug nuisance you deal with? What other tips can you offer to clean up and seal up the home? What’s your craziest “bug-inside-the-home” story? 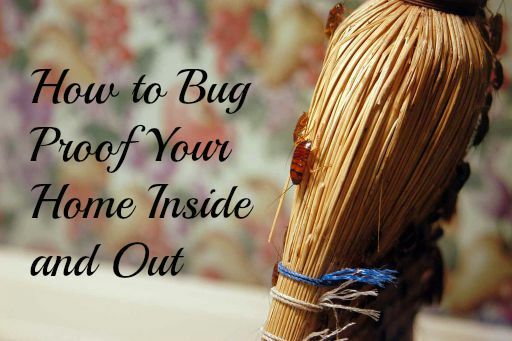 What else have you done to bug proof your home? Hm, I’ll have to talk to my husband about cutting back some branches and bushes in our yards. We’ve had a few issues with pests for the past two weeks. Now I think that I need to hire a professional to get rid of all the pest problems. Your focus on prevention is definitely a conscientious one. This post will prove helpful to others taking this route. You have some common sense tips and some that home owners may not be aware of, such as placing fruit in the fridge and sealing leaky plumbing. Installing a self-closing screen door is a nice tip as well. Bed bugs can be very tricky to get rid of. So I make sure to check all those small space in my walls near the bed. They usually hide in the cracks. I detest pretty much every type of bug in my home, so any tips to keep them out are definitely appreciated. Your advice to clean up food spills right away and to generally keep the kitchen clean is pretty solid advice to keep bugs away. I have a tough time following that advice with two young kids, but when I do, I always seem to have fewer flies and ants around. Thanks for the article! “…clean up food spills…” That’s a big key. Whenever we miss a kid spill, it seems like we have ants the next morning. I’ll make sure to take note on this. Another thing, some essential oils can also be use as pest control. its safe to use and almost available in any household. Stephen Ray recently posted…Hello world! I hate bugs in the kitchen. What I usually do is aside from cleaning up I maintain that almost all part of the kitchen are dry mostly to keep them out. And, I become Mr. Fix-it asap, as a matter of fact, just yesterday, I replaced holes in screens and walls, especially around windows and doors. Ants have been really bad for us here in Michigan, a lot more so than normal. I spray the perimeter of the house and that has kept them out in years past, but this year we had a stretch where they kept getting in and every time we went into the kitchen, we’d have a couple to kill. When I’m sitting out on the deck, if I happen to be in bare feet, I’ll inevitably get them climbing up my foot, which has never been a problem until this year. Just annoying! Money Beagle recently posted…Another Big Hack And Nothing To Worry About For Me! I have noticed that this summer has been particularly bad for us for fruit flies. They seem to be everywhere in our kitchen and it is awful (I just find them so gross)! I am trying to take the green bin out more often and empty the garbage in a timely manner but it just doesn’t seem to be enough. I am hoping they go away soon!